Retail area has a radius of 100 miles and a population of 40,000 people. Hughes County has 215 farms with farmhouses and 168 farms with no dwelling with a total of 415,151 taxable acres. In the United States, South Dakota ranks fourth in sheep raising, ninth in beef and 10th in hog production. The average growing season is 180 days. The affairs of the City are managed by a Mayor-Commission form of government. The term of office for all members of the commission is three years. Municipal elections are held in June of each year. All other city officials are appointed by the mayor with the approval of the commission. The commission meets every Tuesday to handle official city business. The Pierre Police Department is comprised of twenty-two full time uniformed policemen fully certified by the State of South Dakota through the Law Enforcement Standards and Training School at the Law Enforcement Academy in Pierre. Pierre policemen are trained to give maximum protection to the community. The Police Department operates five marked patrol cars, four unmarked police vehicles and one motorcycle. Radio contact is maintained with the Sheriff’s office and State Highway Patrol. The Sheriff’s Department, which is staffed by 15 full time persons, is in charge of the jailing facilities. These facilities accommodate 48 maximum security prisoners and 12 work release prisoners and include two isolation cells and two detox cells. Located in the Sheriff’s Department is a new juvenile shelter care facility that accommodates six juveniles. The police department provides radio dispatch and Enhanced 911 for Hughes and Stanley counties. It also monitors Marine Band Channel 20.
from a 102-foot aerial platform. The 70 miles of streets in the City of Pierre are hard-surfaced. A continuing plan has been developed and is in operation to maintain good streets and roads. The area of Pierre is 12.94 square miles, 8,282 acres. The Pierre Industrial Park is adjacent to the Municipal Airport and yet is only minutes from downtown Pierre. Zoning is light industrial, offering many possibilities for industries and businesses. One-acre lots are leased for private construction. Utilities are in close proximity to all lots; renters are typically required to bring utilities from the nearest location to their lot line. In turn, lease rates are minimal and no property taxes are paid by the renter on the land, only on their own building or improvements. Being the State Capital and centrally located, Pierre serves as the convention and meeting headquarters for South Dakota’s public and private organizations. A full service Convention and Visitors Bureau is available to the meeting planner. Pierre has 30 meeting rooms in 6 facilities that can accommodate any size group from 20 to 1900. In 1987, Pierre completed a $3.4 million convention center located on the waterfront. This 30,000 square foot development includes a banquet hall, meeting rooms, two “state of the art” amphitheaters, and exhibit space. Fifteen motels with 974 rooms are available to serve the visiting tourist, sportsman, or businessperson. The South Dakota State Library in Pierre houses over 170,000 volumes and provides an educational service for all residents of South Dakota; users may obtain information, books, periodicals, and reference materials from the shelves of other libraries around the country and the world. Computers and internet access are also available. The R.E. Rawlins Municipal Library offers complete adult and children’s sections, over 43,000 books, a historical library, complete collections of periodicals and records, talking books, large print books, cassettes, compact discs, videos and artwork. A story hour and other programs are offered for children. Meeting rooms and computers are available for pubic use. Pierre has a fine Senior Citizens Center offering many programs. Rent assistance and low-income housing are available to the elderly, along with other services such as “Meals on Wheels”. St. Mary’s Health Care Center, an 86 bed acute care facility. 2 Nursing Homes-Maryhouse – a 23 bed medicare – certified sub-acute center and 82 bed skilled & intermediate nursing home. – Missouri Valley Nursing Center – one 72 bed skilled and intermediate nursing home. 4 clinics served by 21 physicians and 30 visiting specialists which include: an allergist; birth defects; genetics; cardiologists; craniofacial anomalies; dermatologist; ears, nose and throat; endocrinologist; neurologist; ophthalmologists; urologist; podiatrist; pediatrician. There are over 124 clubs and organizations represented in the Pierre area; most public and private State associations are headquartered here. Pierre area residents are proud of their 30 churches, representing 24 denominations. The YMCA offers programs for adult and youth; facilities include swimming pool, racquetball courts, fitness and exercise rooms. Other exercise/fitness and toning centers are available. The Short Grass Arts Council is a volunteer organization that provides information on the arts in the Pierre-Fort Pierre area and in surrounding communities. This organization is interested in the promotion of all art forms. Pierre Players theatrical group presents productions throughout the year. The Pierre Concert Series offers a variety of music and dance productions by professional touring groups. Canvasbacks is a local group of artists. Nightwriters, a group of writers and poets, and many other talented local artists live in the Pierre area. The Pierre area offers a wide range of recreational opportunities for all ages. Pierre’s location on the Missouri River provides a wealth of sites, recreation areas for all ages and the nation’s finest fishing. Griffin Park is the major park area in the city with 32 acres; included in the facility are a swimming pool, free lighted tennis courts, boating, fishing, playground equipment, picnic facilities and free camping (3 day limit). The City also owns an 18-hole, 72-par municipal golf course located one mile east of the city. Individual and group lessons, can be arranged. Five miles upstream from Pierre, on the Missouri River is the Oahe Dam (pronounced O-wa-hee). The dam’s embankment is the second largest earthfill structure of its kind, with a crest length of 9,300 feet and a height of 245 feet. Lake Oahe, stretching 231 miles upstream, is the longest lake on the main stem of the Missouri River. 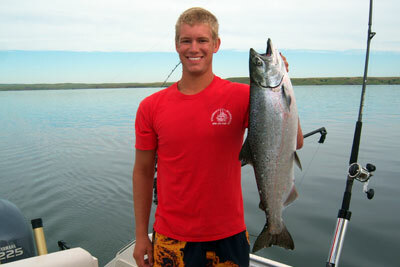 Lake Oahe’s 2,250-mile shoreline has become a bonanza for the outdoor recreationist. Swimmers, water skiers, fishing and boating enthusiasts, scuba divers, snorkeling, campers and picnickers alike enjoy their choice of outdoor activity at Lake Oahe. Anglers come to Lake Oahe in search of a variety of sport fish, including walleye, northern pike, Chinook salmon, channel catfish, small mouth bass, white bass, sauger, bluegill and crappies. Public hunting grounds offer excellent waterfowl and upland game hunting featuring Canada geese, mallards, pheasants and grouse. Whitetail and mule deer and antelope also abound offering challenges to the big game hunter. Knowledgeable guides and game lodges are available to provide enjoyable and successful hunting experiences. Recreation areas have picnic tables, electricity, shelter buildings, concession stands, nature trails, camping, sanitary buildings and fireplaces. Concrete boat launching ramps have been provided at several points on the lake. Farm Island Recreation Area, located 2 miles east of the city, and Oahe Downstream Campground, also offer outdoor recreational facilities. Included are campgrounds, boat landings, nature trails, bicycle and fun cycle rentals, disc golf at Oahe Downstream, beaches, fishing, and accommodations for recreational vehicles near Oahe. LaFramboise Island features eight miles of nature trails and seasonal bow and arrow hunting. Just across the river in Fort Pierre, springtime pari-mutual horse racing can be found in addition to a host of rodeos and stock shows. Approximately 70 percent of the time, the Pierre area enjoys clear visibility of more than forty-five miles. The air is clear and unpolluted, with low humidity. Winds average less than 10 miles per hour and fog occurs less than a dozen times a year. Weather is suitable for flying approximately 355 days a year. The City of Pierre receives power generated by Western Area Power Administration (WAPA), with excess demand provided by the Missouri River Energy Services. WAPA allotments are 21,155 Kw demand in the winter and 29,881 demand in the summer. Pierre’s electric rates are approximately one-half of the state’s average and among its lowest. An abundance of pure water is readily available from Pierre’s five reservoirs possessing an 8 million gallon capacity. The source is comprised of 10 wells with a total pumping capacity of 6100 GPM which far exceeds the 1700 GPM average demand. The capacity of Pierre’s sewage treatment plant is 1.9 million G/D exceeding the average demand of 1.1 million G/D. Electricity, water, wastewater and solid waste services provided by Pierre Municipal Utilities. For current rates, visit http://ci.pierre.sd.us. Montana Dakota Utilities Co. provides natural gas distribution to the cities of Pierre and Ft. Pierre. MDU has provided natural gas to Pierre/Ft. Pierre and central South Dakota since 1993. Telecommunications services in the Pierre area are served by Qwest Communications. Qwest uses AT&T’s 5ESS’ digital electronic switch system to provide state-of-the-art telecommunications services to the Pierre area. This switch system uses the latest information age technologies to achieve a very flexible, economical and highly reliable communications service for the area. The state’s Dakota Digital Network links classrooms and conferences throughout the state to the world and is centered in Pierre. A fiber optic ring, two points-of-presence, full redundancy, and the nation’s first Transparent Local Area Network provide business with low cost, high quality commercial service. The Regional Airport, located three miles from the center of Pierre, is within the city limits. Facilities include offices, ASOS, boarding and baggage terminals. There are two runways, approximately 6900 feet long. Aerodymanics Inc. operating as Great Lakes Express. Daily 50-seat Regional Jet service to Denver. Mustang Aviation 605-224-9000. Offering chartered flights throughout the United States. Canadian Pacific Railway. Transports freight east and west. It’s depot has facilities for loading and unloading shipments. Snappy Delivery, Inc., 605-224-4612, Snappy Delivery Website, Moving, Packing & Storing. All provide next-day services nationwide. The Pierre community places a high priority on education. This is shown through a supporting school board and public. Pierre School District has the highest accreditation by the South Dakota Division of Elementary and Secondary Education. Riggs High is accredited by the North Central Association of Colleges and Secondary Schools, and has earned a “Gold Medal” ranking from “Expansion Management” magazine’s Education Quotient study, placing Pierre among the best in the nation. The district is governed by an elected five member policy making Board of Education. Pierre’s school system includes four elementary schools, one rural K-8 school, one middle school and one senior high school. The Pierre School System has a computer education program that has become a model for the state and region, and features networked computer labs in all buildings. Pierre’s schools offer a year-round mentorship program that gives students hands-on opportunity working in the profession that interests them. The community includes St. Joseph parochial school, For His Glory Christian school and the Pierre Indian Learning Center. An alternative education program is also operated in conjunction with The Right Turn. Qualified teachers instruct in the areas of modern math, social science, art and language arts. Specialized teachers offer music and physical education programs. All three schools’ K-5 function on a modified self-contained classroom plan. Grade 6 functions on a departmental plan, which prepares students for the Middle School. The Georgia Morse Middle School offers the most advanced program in the state at the Middle School Level. Georgia Morse Middle School provides new courses emphasizing foreign language, science, industrial arts, comprehensive home economics and computers. The Middle School offers a wide variety of fine arts programs. The Technical Education Center provides the latest innovations in science, math, and technology education. Guidance and counseling are directed by specialized personnel. Riggs High School offers 100 modern courses with a balanced program of fine arts, clubs and athletics. All students receive individualized guidance and counseling. Riggs High School produces high achieving students. ACT scores of Pierre students are above the state and national averages. The amount of scholarships awarded to 1998 students totaled $798,287. The Pierre School District and Chamber of Commerce are partners in a national award winning School-To-Work program. PEDCO has proven its ability to be as creative – and aggressive – as necessary to provide an incentive package that will create new jobs and investment in the Pierre area. In addition to the many financing tools below, new or expanding employers can get help with training, finding workers, site selection, zoning and regulations, permitting, and even application for applicable grants. Up to 45 percent of a project’s total cost, requires matching funds and 10 percent minimum equity. Provides permanent financing for the purchase of land and associated site improvements, construction, acquisition, and renovations of buildings. Interest rates 3 percent, amortized up to 20 years on a building and 10 years on equipment, with a balloon payment due after five years. Long-term, fixed-rate financing for fixed asset purchases including land, buildings, new construction and equipment with a useful life of 10 years or more. Equity injection of 5 to 10 percent may be required. Made to small businesses within the borders of SD and SD residents, including main street and retail operations, for working capital, equipment, real estate or other fixed asset project costs. Max. loan $20,000. Guarantees up to 90 percent of a loan made by a commercial lender. Loan proceeds may be used for working capital, machinery and equipment, buildings and real estate, and certain types of debt refinancing. PEDCO’s loan fund is considered gap financing designed to allow local banks to share their risk while creating or retaining jobs and wealth in the community. Participation, rates and terms are at the discretion of the PEDCO Board of Directors. South Dakota does not have a personal or corporate income tax, inventory tax or inheritance tax. The city of Pierre has a 2.0% sales tax plus an additional 1% on hotel/motel, restaurant, and liquor establishments. State sales tax is 4.5%.